When I had to be in the hospital for a while during my college years, a friend brought me this special book ? 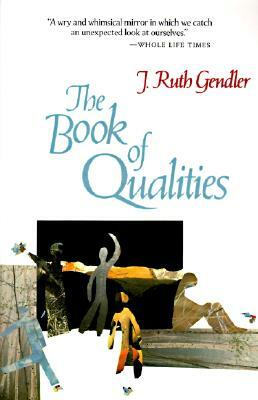 J. Ruth Gendler?s ?The Book of Qualities?. Since then, I have turned around and given copies of this book to all different people in my life. I?ve shared this beautiful little book as a gift for graduations, wedding showers, birthdays, major illnesses, surgeries, and as a thank-you note. I?ve read selections from it at open mike nights, support groups, and memorial services. In ?The Book of Qualities?, poet and artist Ruth Gendler dedicates one page to each of almost one hundred human characteristics and feelings. These are the Qualities. With playful and insightful words, she describes each Quality as though he or she were a person you know. Change becomes your unwelcome houseguest; Honor could be your grandfather; Courage may be the woman who befriended you as you faced your divorce. Each of the Qualities has a favorite color, or a hobby. They have faces and hair and cars and clothes and jobs. And in those characteristics, in each Quality, you will recognize yourself and those you know ? often in delightful and startling new ways. This little book is truly a classic: one of those books that you will find yourself revisiting time and again, once it has become a part of your life. Every time you re-read it, you?ll find something new. I used to dream about owning a bookstore just so I could buy this book in bulk, and let everyone know how wonderful it is .... now I do!